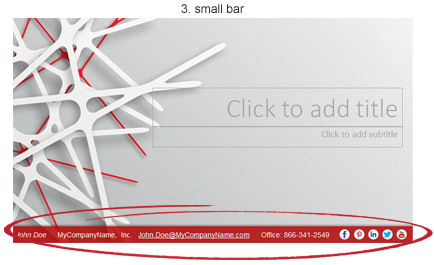 Add a professional contact bar with social networking to your presentations! The most important part of your presentation is YOU! 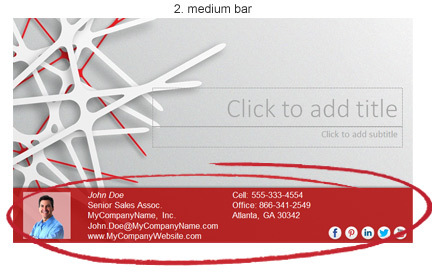 The Advanced Contact Bar makes it easier than ever before to put your contact info along with social networking buttons into your presentations. Insert a head shot/Company logo and social media buttons with hyperlinks. The contact bar is fully compatible with web converters like HTML5Point so your online shared presentations can always quickly link back to you. Add social networking to PowerPoint! The Advanced Contact Bar will automatically layout your logo/head shot, contact details and working social network buttons with hyperlinks. Get more likes and more followers on Facebook and Twitter with direct links from every presentation you share! Everyone who views your presentations will know how to reach you. Fill it in once! Saves all your changes automatically. Includes common social networking buttons built in. Add/Edit your own details to completely customize the content. Choose from 3 sizes of contact bars to fit your needs. Layout and spacing of your information done automatically. Set the bar and font colors from the color scheme to perfectly match your slides. Insert your contact bar onto a single slide or on all slides at once. Advanced Contact Bar has 3 size layouts. 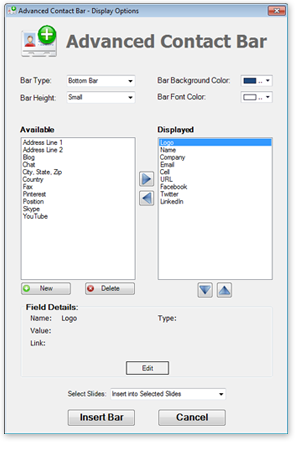 Choose from 3 types of contact bars. 1. Small bar: A single line at the bottom of your PowerPoint slide with room for 3-4 text boxes and up to 8 hyperlinked social network buttons or images. 2. Large bar: A taller bar at the bottom of your PowerPoint slide with room for a head shot or logo, 2 columns with 5 rows each of text and up to 12 hyperlinked social media buttons or images. 3. 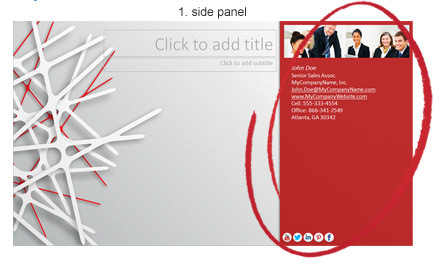 Side screen cover: A large bar on the right side of your PowerPoint slide that covers 1/3 of the slide area. This option gives you plenty of room to include a large logo/head shot, plenty of room for text and your social media links. This option also has extra room for any other items you may want to add such as a photo map of your location. All your information and settings get saved automatically! Insert the bar into the current slide or to all slides at once.